We landed in Naples on March 20th, having left Athens in the pre-dawn hours as Greek CNN began broadcasting breathless reporters in flak jackets and helmets. It was all Greek to us, but the night-vision neon-green bombs lighting up the screen left little to the imagination. When we landed in Italy, we half wondered if the scene on CNN had been a dream. We spent all of ten minutes in Naples, then boarded a bus to travel down the stunning coastline towards Positano on the Amalfi coast. The ride was breathtaking for its awe-inspiring beauty, and for the fact that it struck the fear of god in us! As the bus traveled past olive groves and vineyards, cornering narrow, stomach-churning passages far above sea-level, we felt like we were inches away from plunging to our deaths. The ocean below was so clear, you could make out the rocks on the bottom of the green water from hundreds of feet above. 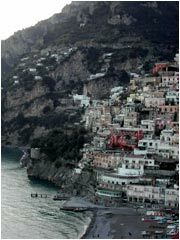 Positano was even more breathtaking, with its cliffside-studded terraces of buildings, its narrow mazelike streets with curving alleyways opening up onto more curving alleyways, and its steep stairways leading down to the ocean. (Climbing back up those hundreds of steep stairs was most breathtaking of all.) It's a place where every house has laundry snapping in the sunshine, where little old ladies march up the streets in wool cardigans and sensible shoes carrying trays of cannolies, and little old men gather in the bakery doorways to discuss world events and weather with the fishermen who own the red wooden boats on the beach down below. It was as if we had turned back the clock a hundred years. 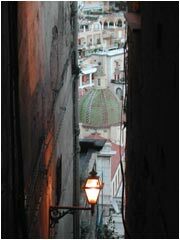 We saw old-world meet new when we boarded a yellow "scuola bus" full of teenagers in tight jeans with cell phones and blonde highlights streaking dark Italian hair. Positano was one of the only places where we had trouble finding a room. We arrived around 3pm and started hiking the hills in search of lodging, struggling under the weight of our backpacks as we navigated the steep streets. (We struggled with those streets, backpacks aside — they're not for the faint of heart!) We found a "Closed" sign hanging in every restaurant, storefront, guesthouse and bakery, as the entire village was on siesta. We also encountered our first real language barrier, and found ourselves communicating via charades more often than not while in Italy. As luck would have it, we stumbled on a beautiful guesthouse — the Villa Maria Lousia — perched on the brink of the cliff. Carlo, the owner, amiably let us talk him down from 65 euros to 50 euros for an ocean-view room with a terrace. (Dana could hardly contain her glee while trying to maintain a poker face, as the whole place looked and felt like Folly Cove — only higher, more stunning, and Italian!) "Okay, Okay," Carlo nodded slowly, rubbing his belly like a pregnant lady, smiling with his eyes through the olive-oil grime on his thick lenses. He made small-talk about the war, shrugging his shoulders with a contented sigh and a belly-rub: "Whaaadya goooonna do? These things-ah…they haaappen." He then directed us to his brother's pizzeria, his sister's restaurante, and his cousin's cappuccino café: "You go to my cousin, he take-ah goood care of you." Soon, we were rubbing our own bellies, sneaking siestas, and gazing out over the peaceful ocean from our veranda thinking: "What-ah war?" As Carlo said, Positano — at least in the off-season — is "the kind of place where you can sit quietly up in the hills with your oranges." We spent five days on the Amalfi coast, visiting nearby towns, hiking, reading, and napping — waking to waves crashing at the base of the cliffs and the occasional thunk of a soft-ball sized lemon falling off the trees. 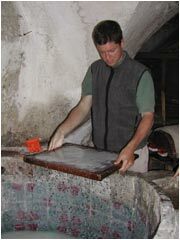 We learned to make paper the old fashioned way in a cave under an ancient paper mill. And, we ate. And ate. And ate. We gorged ourselves on pizza and red wine, cheese, prosciuto, and bread. We'd tour a nearby town only to find ourselves sitting on church steps (we couldn't afford the sit-fees at the sidewalk cafés) gobbling gelatis and watching the world go by. Dana gained back all the weight she'd shed in India in a matter of minutes, while Will arrived home in Folly Cove still twenty pounds lighter. (Men!) Feeling the remaining weeks of our trip ticking away, we sadly said goodbye to Positano and rolled our way towards Pompeii.